Have you ever thought there must be other ways to use a trencher? Sure, the obvious one is that it creates a trench, but did you know there are other uses for this type of machinery? Use this guide to learn about the five different ways you can use a trencher for your next construction project. Trenchers are pieces of earthmoving equipment that use a metal chain with teeth made of high-strength steel to rip into the ground like a chainsaw would into a tree. Similar to an excavator, a trencher rips up the soil and any roots in the way to create a trench. Digging a trench by hand can take hours and several workers to complete. With the help of a trencher, trenchers can cut down the time and number of people needed to finish the project. You can choose between walk-behind or ride-on trenchers. Walk-behind trenchers, or portable trenchers, give you the ability to dig trenches more easily in a more narrow space. Ride-on trenchers give you a higher performance and cover greater digging depths when compared to walk-behind ones. There are two different types of trenchers available to rent: wheel trenchers and chain trenchers. Wheel trenchers: This type of trencher has a toothed metal wheel, and you can use it for hard or soft soils. Wheel trenchers work best in areas where there are many rock formations. Also called rockwheels, these trenchers cut pavement and create access under roads for utility companies. They have between six to eight cutting elements found around the wheel, and this design allows the wheel to cut at varying depths. Spacers and ejectors move the excavated materials away from the trench’s edges. Chain trenchers: This type of trencher has a chainsaw-like design. It uses a digging belt or chain to cut the ground. Its belt wraps around a metal frame, also called a boom, and you can easily adjust it to control the depth of the cut. Its bucket-type excavator helps to cut hard ground. Due to their flexibility, chain trenchers can cut narrow and deep trenches for utility companies. Use wheel trenchers to cut through rock, pavement, or concrete. You can operate wheel trenchers on difficult ground conditions and obtain clean, straight trenches. They also work well on patch and joint replacement projects involving highways, streets, and interstates. Save money and time needed to dig several feet of soil by using chain trenchers to create drainage trenches for water or sewage runoff. Once you dig up the soil with a portable trencher, you can run sprinkler or irrigation piping underground. Maybe you’re a homeowner who wants to avoid hours of painful shoveling that causes blistered hands. A smaller walk-behind trencher can cut down on the time needed to complete a project. Use this smaller version to dig 3 to 4 feet deep. If you need to dig underground for electrical or telecommunication wires, you can use chain trenchers from the power pole to the residence. You could also place wire for electric dog fencing or landscape lighting in trenches. The trencher’s conveyor belt removes the excavated materials. Using a trencher cuts down on the time needed to create the trench, and this allows you to spend more time securing the wires in the ground. In addition to cutting concrete and making rows in the soil, portable trenchers have a blade that serves as a rotary lawn mower blade and severs roots. 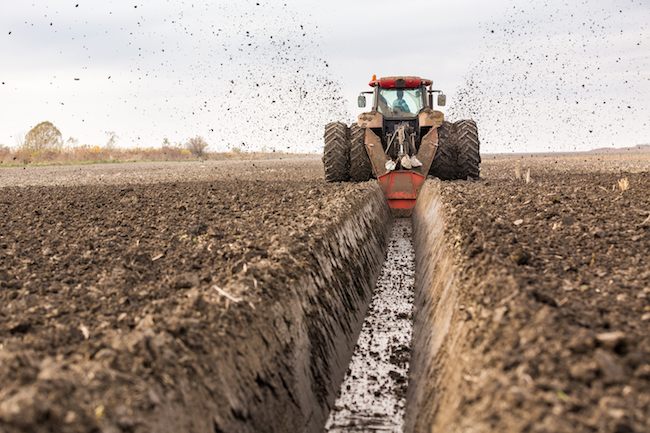 If you encounter roots while working the soil, hold the trencher’s chain blade in place while the blade spins. Slowly inch the blade forward and let the blade cut through the roots. You should avoid using a trencher around rock-prone areas. The teeth found on the equipment cannot cut through solid rock or areas with rock-like sediments. Torn teeth can cause shards of metal to become stuck and cause problems with the machinery. In addition, before you start digging up the ground, you should contact the local utility companies to determine if the area is safe for digging. Although you can use trenchers for a variety of construction projects, it’s best to rent these types of machines instead of purchasing them. That way you can make sure that you have the best one for all your needs. If you need additional help in finding the best trencher for your project, talk with the experts at BigRentz.com. You can also contact the company directly at (888) 325-5172.